Most of that discussion is fairly straightforward and generally easy to illustrate and explain. That’s especially true given that all of it’s categorical. For example, cattle are either weaned or they aren’t – and there’s a distinct value difference between the two categories. But when it comes to dealing with price slides and/or weight stops (never mind shrink for this discussion), my experience has been those principles are generally more difficult to understand. Price slides effectively adjust the price downward as cattle exceed the contract base weight. Meanwhile, weight stops establish a hard break – any weight beyond the weight stop will not be paid for, thereby establishing a total dollar ceiling. 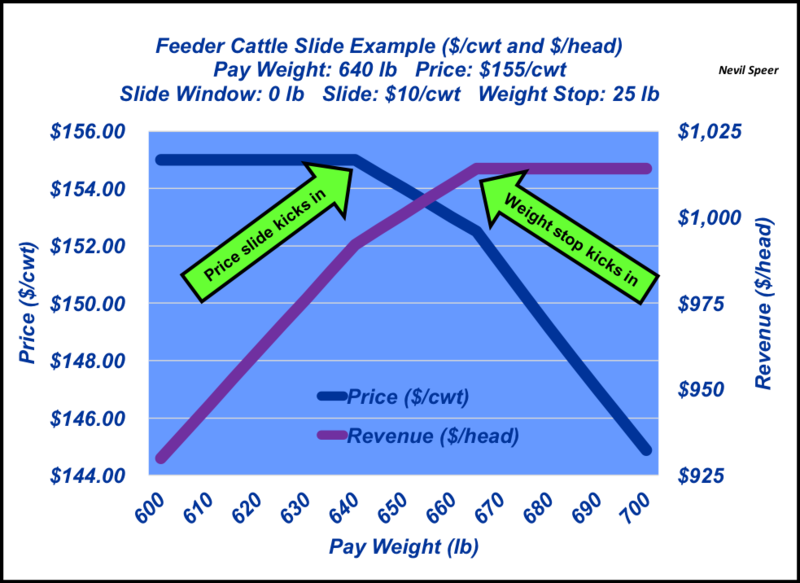 This week’s illustration highlights a straightforward example for 640-pound calves priced at $155 per cwt with a $10 per cwt right-side slide (a slide applies only to the cattle as they get heavier), no slide window (zero tolerance beyond the base weight) and a 25-pound weight stop in place. There are any number of combinations that could be created, including addition of a two-way slide, inclusion of slide windows and/or removal of the weight stop. The numbers are for example purposes only and not meant to be suggestive nor reflect any implications about what these values should be. Several things are important. First, the graph shows the price slide kicking in at 640 pounds. Accordingly, the effective market price begins to decline beyond that point. Second, the weight stop kicks in at 665 pounds. Therefore, any extra weight beyond that point is essentially free to the buyer. Note that total revenue maximizes at the weight stop – not at the base weight. It’s critically important to understand those relationships before entering into a contract and subsequently making delivery. How are you looking to price your cattle? How do these factors play when you decide how to market your calf crop? Leave your thoughts in the comments section below.